Children's programs include storytimes, after school programs. Adult programs include book groups, computer classes and instructional programs. Also summer library program is offered for all ages. Friends of the Library in partership with the Postal Service will deliver large print and audio books to homebound patrons' homes. 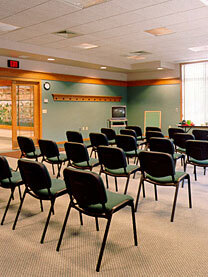 The Conference Room and the Community Room are available for meetings during library hours. Reservations are required for both meeting rooms. Non-reservable study rooms are also available during library hours. Meeting room policy and reservation forms.